Yes, I have looked at the calendar. Yes I do realise that it is November. I even suspect that some of you will have had to plough your driveway to get to work, or at least switch from shorts to long trousers. In fact today here in Edinburgh we awoke to our first bright and frosty morning – all sparkly sidewalks and retina-searing but ineffective sun. And, here I am blogging about salad. Not a little – possibly acceptable – side salad, but a proper, in your face, entire meal kind of salad. With protein, fat, carbohydrates – the lot. Yes, it is a little odd. I think some posts ago I might even have sworn off salads – or salad posting at least – for the foreseeable future. Well, I lied. Not lied exactly as realised that I could not in all good conscience let months and months of miserable, cold weather get in the way of this salad. Frankly it is worth the temporary about-face from warming soups, hearty stews and cosy baked stuff, and the odd looks from any disbelieving family members. Especially the odd looks. Indeed, let this be your little slice of summer sur winter and leave them to their stew or stir-fry. But you are probably much nicer than I am and will happily share this feast of vegetables, tea-smoked tofu and finger-licking sauce. I did actually share this with my daughter the last time I made it, but Mr A had to make due with a few meagre tastes of fridge-chilled sauce and raw carrot while Miss R and I declared ourselves too full for dinner. Essentially this is a winter version of an Indonesian vegetarian staple dish. 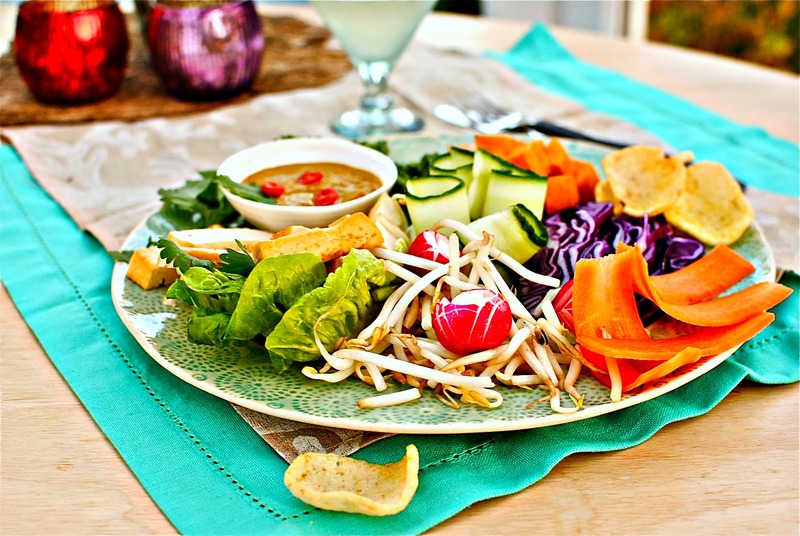 If you don’t know about gado-gado it can be summed up as a peanut sauce-drenched salad. On steroids. To use the vernacular of many years ago – and for which I do not know the current, wholesome, equivalent – gado-gado rocks. It is so good that in Indonesia it is served not only from hawker carts but also in the finest restaurants. For my seasonal tweak I’ve subbed the more usual long/green beans, hard-boiled eggs, boiled potatoes, lettuce and tomato for thinly sliced purple cabbage, steamed sweet potatoes, steamed broccoli, carrots and radishes (which I made a bad attempt at turning into flowers). 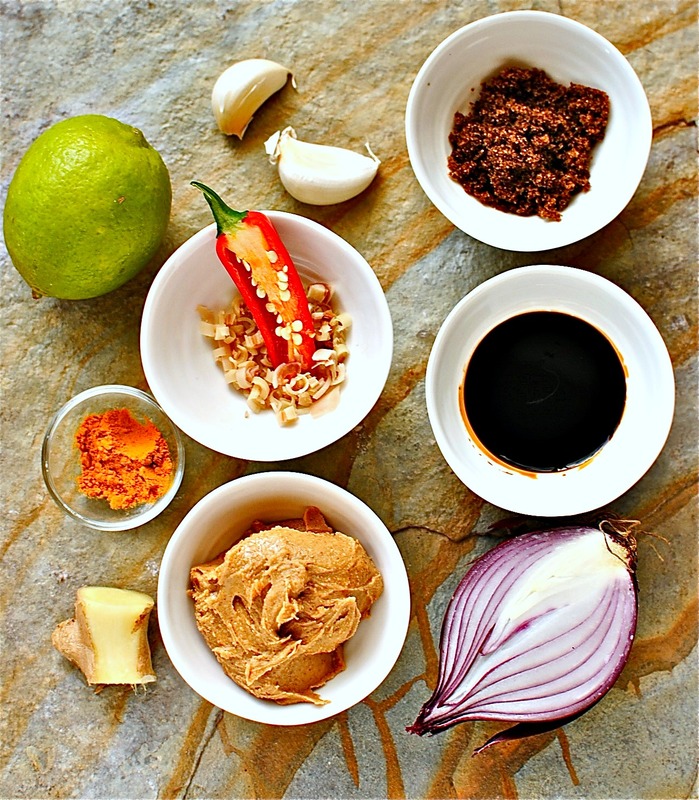 But really use what vegetables you like because the main thing about gado-gado is the spicy peanut sauce. Lots of it. No wimpy light drizzle; we are talking full-on tropical storm of peanut sauce. Of course you don’t need to make it super spicy (mine is mild and family-friendly), but you do want a balance of spicy, salty, sour and sweet. That’s non-negotiable. I don’t always measure when making the sauce – just tasting and adjusting as I go along, sometimes more sour, sometimes more salty. I encourage you to do the same. Maybe make it once as written and then make it your own next time. As for the tea-smoked tofu in the title, coincidentally I made it the day Jeanette posted her tea-smoked chicken, using a near-identical method. I had always wanted to make tea-smoked something or other, having seen a local chef knock up tea-smoked mackerel in all of five minutes. But to be honest it was a bit scary doing it in the wok. We can buy pretty good smoked tofu so if that’s an option for you, buy it. If you are a bit daring try smoking on an outdoor grill, in a wok or in a smoke box using these ideas from what the hell does a vegan eat anyway, where they smoke all kinds of things (LOL), but for longer than I do here. On this video they use wood, but tea is amazing (see below for recipe). Some of you may be wondering about cancer-causing HCAs and PAHs that form when smoking or (accidentally) burning meat, but the tofu is not burned in any way (no caramelisation either), and there is no creatine to precipitate out, change molecularly, and be reabsorbed. And it doesn’t have salt or nitrates to complicate matters (I paint on a marinade afterwards and bake in the oven). This isn’t everyday food in any case. I will give it another go, smoking several slabs of tofu and tempeh at once as the taste result was pretty amazing for so little actual effort. If nothing else it is a good way to see if your smoke alarms work 😀 (actually no smoke leaks outs if you are careful). For ease use bought marinated or smoked tofu if you like, or even replace the tofu with cooked prawns/shrimp or hard-boiled eggs. I may have a go at smoking some cooked chickpeas and making a barbecued hummus! Have you ever done any home-smoking? What did you smoke and with what? Do you have any tips for us? 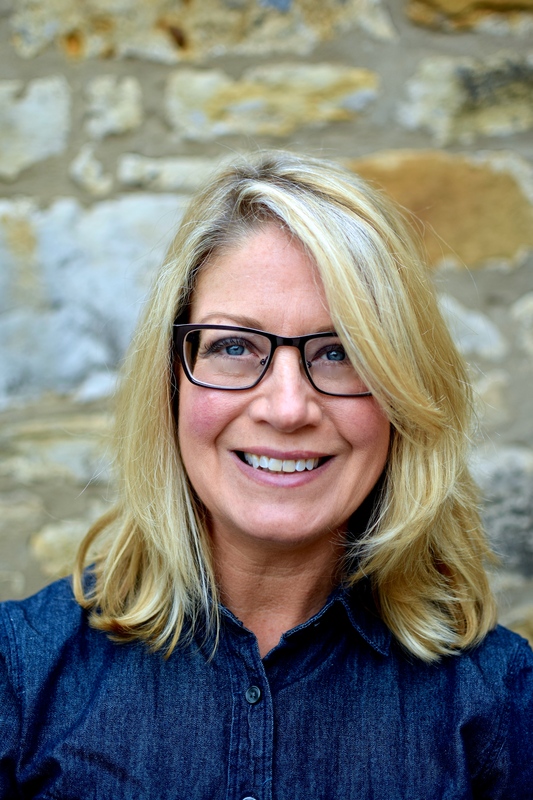 Announcement: Becs at laythetable has won the Nakd bars prize! Congratulation Becs and expect a healthy parcel of goodies very soon! This is my winter version of an Indonesian vegetarian staple. 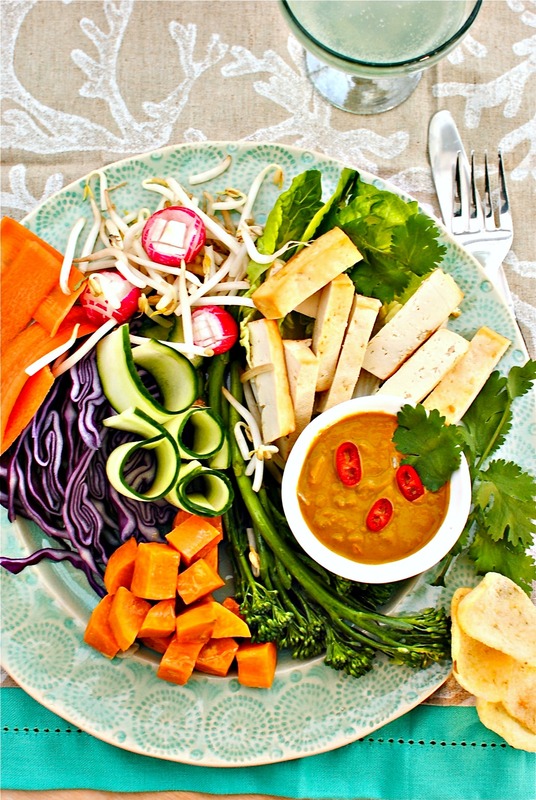 If you don’t know about gado-gado it can be summed up as a peanut sauce-drenched salad. On steroids. The main point of gado-gado, as far as I can see, is having a grand excuse for eating a load of heavenly peanut sauce-doused vegetables and tofu and still feeling quite virtuous. Leftover sauce can be used as a dip for raw vegetables, or spread on bagels and made into a delightful sandwich, with strips of raw veg, sriracha and maybe some slices of hard-boiled egg. If however you are like me, you will just eat it straight off the spoon. As always with food to glow recipes, scan it and make any dietary or taste changes as you see fit. For instance anyone with an estrogen-sensitive cancer will want to avoid the tofu, replacing it perhaps with prawns or hard-boiled eggs. And just another note: although for the sake of a less messy looking dish I have demurely spooned my sauce into a wee bowl, the sauce should ideally be tossed through all of the vegetables, or at the very least spooned extremely generously and carelessly over the whole salad. Generous + careless do not make good photographs. Heat the oil in a small pan and lightly sauté the onion, garlic, chilli, ginger, lemongrass and turmeric until the onion is soft. Stir or whisk in the remaining ingredients, adding water slowly as the sauce thickens. I find that whisking the ingredients and only adding a little water helps to get it mixed, and then I whisk in the remaining water. Keep warm. I smoked ½ lb (250g) of tofu using a smoking mix of 1 tbsp brown sugar, 1/3 cup of lapsang souchong tea (or other black tea) and 1/3 cup of rice. You could use any amount of tofu you like that will fit in the wok in one batch. You can’t reuse the smoking mixture. 1. Wrap the tofu in several linen tea towels (or just don’t used the furry, terry kind) and set on top it a heavy pan or a chopping board with cans atop. Let this sit for at least half an hour, but ideally two hours. This gets rid of the water inside the tofu. If you have frozen tofu, defrost and do the same. 2. While the tofu is being pressed, prepare the wok for smoking by lining your wok with a double layer of foil. Add the tea mixture and then top with a metal trivet and basket, or round cake rack. See also this video for visual instructions and options. 3. When the tofu is ready for smoking, slice it and place it in the basket or on the rack. Tightly top the whole wok with foil, with a tiny bit still open to see when the whole thing starts smoking. Turn on the heat to medium and when you start to see smoke (that’s the sugar), carefully close the foil gap and put on the wok lid or a heavy baking tray. Let smoke for 10 minutes, staying close by. 4. When time is up turn off the heat and let the whole thing cool down before opening up and removing the tofu. I took my wok outside but there was no need as I let it cool enough for it not to smoke. Now do the next step if you like, or use as is on the salad. 5. Oven-baking step: mix together 1 tbsp of soy sauce and 2 tsp of sesame oil and gently coat the smoked tofu. Lay this on a foil-lined baking tray and bake in the oven for 15 minutes at 180C/350, or until golden and starting to get firm. Use the tofu in this recipe or save for other uses. Keeps in the refrigerator for five days. When you are ready to make up the salad lay the vegetables, coriander leaves and tofu on a wide plate and cover well, or toss with, the peanut sauce. Serve with lime wedges and Indonesian crackers or prawn crackers (I used Waitrose’s spicy vegetable crackers with lemongrass – delish!). I will continue to eat salad: we had a mackerel Nicoise type thing last night, with a big bowl of beetroot soup to balance things out and not be too weird. I just came back from Florida seeing my family and it ws so hard to leave that assured warmth. Booking a return visit for our coldest UK month – February! Woah, if this tastes even half as good as it looks, we are on to a very scrumptious meal, lovely, zingy colourful, flavour busting food, yum, thanks for that! Kellie, I haven’t had Gado Gado for years! Such a delicious recipe, thank you for sharing. I need to try smoking food at home. Sounds and looks delicious – think it would work as a warm salad too. The way I eat it the sauce is warm and the veg are still clinging to their blanched or steamed warmth. Of course right now in Edinburgh (it is -1C) the warmth doesn’t last long!The sauce is also lovely on warm roasted veg and mixed with warm whole grains. What would you do with it? Brrrr – I’m heading to Glasgow soon hopefully it will be milder. Noodles, lentils, wild rice would be great the with sauce. Also i do an aubergine and peanut curry that I might tweak. I love gado gado and your smoked tea tofu caught my eye. and you are right about not able careless mix the sauce for photography. I think this would work even during winter i think. It’s only 3 weeks since I got back from Netherlands, and surprisingly I miss the cold weather. What’s your take on tofu? I’ve tremendously reduced soy based products (except fermented ones like soy sauce, miso or tempeh. High quality ‘japanese’ style tofu is best for sure but any non-GMO tofu is a good sub for animal products occasionally. Tempeh and natto superior choices but not always acceptable to the average person. I quite like tempeh though! Also, caveats for soy and hormone sensitive cancers. 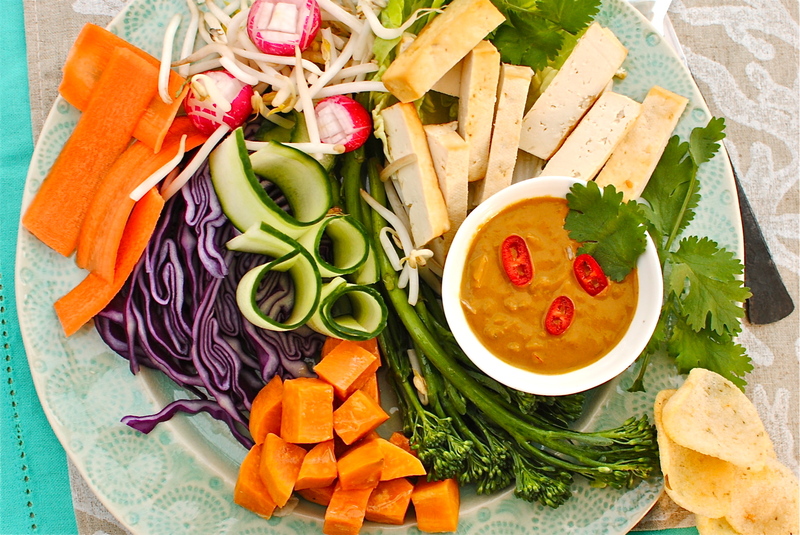 That Tea-smoked Tofu Gado-Gado looks and sounds divine!! Thank you for sharing this. As a vegan, I’m always excited by new and interesting recipe ideas. I’m excited to try this one! Thank you! Salads are not for me at this time of year, but this isn’t a salad and it sounds like my idea of heaven. I haven’t made gado gado for such a long time and now I’ve seen this, it will be appearing at our dinner table sometime very soon. It all looks so delicious. Why do I always read your posts right at bedtime, when I can’t run or to the store so I can make your delicious recipes right on the spot??? My kiddos don’t like peanut sauce. What’s wrong with them??? But Mr. Spicy and I do, so count this going on my meal plan sometime very soon!!! This looks really good! I’ve yet to try tofu but recently gone wheat and dairy free (theintolerantstudent.wordpress.com) so it would be perfect. This has inspired me! Just came accross your blog and love it! This salad looks absolutely amazing! 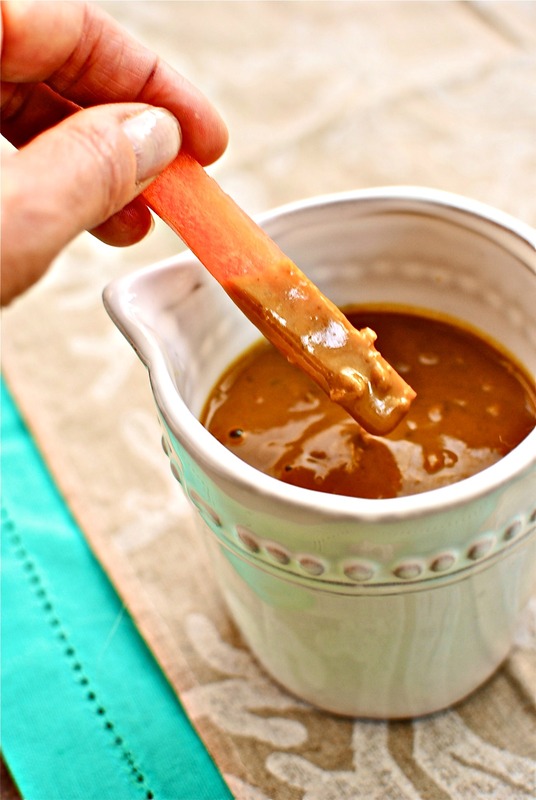 I love the peanut sauce!